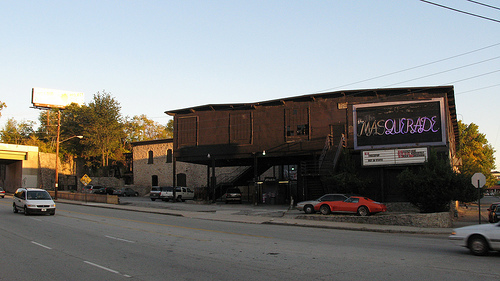 Is the Masquerade Nightclub in Atlanta haunted? The Masquerade was built in 1890 and was originally known as the DuPre Excelsior Mill. During the 1970's and 1980's, the building became a pizzeria, then a small movie theater until 1988 when it became a nightclub, and it remains as one to this day. The main report of a haunting at this location is that of seeing the apparition of a tall, black man walking around inside the club. Who he is however is sadly unknown. Also there are many claims from staff about how the very heavy music amplifiers are turned upside down, sometimes on a nightly basis when no one is in the rooms they are kept. Other reports include footsteps from unidentified sources, cold spots and horrifying screams coming from the back stairs. Could these screams be caused by the spirits of several young girls, who all died in freak accidents in the mill? As well as the various stories of deaths on the property, there have also been an unexplained fire and several structural collapses, not to mention the outbreak of tuberculosis that took the lives of several employees. Several sources of information have claimed that the place is frequently visited by vampires, and that a vampire does in fact even live on the property. This to me sounds like something a bit over the top, the stories are most likely made up from the clubs visitors, as it just so happens to be a goth/metal venue.